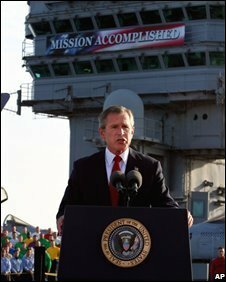 President Bush did not say "Mission Accomplished" on the deck of the USS Abraham Lincoln off San Diego on 1 May five years ago. But the banner above him did. And the picture of those two words said more than the 1,829 words of his speech. 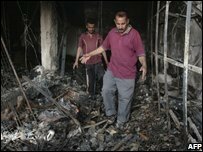 What the president said, among a lot of other things, was: "Major combat operations in Iraq have ended. In the battle of Iraq, the United States and our allies have prevailed. And now our coalition is engaged in securing and reconstructing that country." But the message from the banner said it simpler - mission accomplished. It was all over. It wasn't. Guerrilla war followed, and this has produced more US casualties than the "major combat operations" did. The phrase "mission accomplished" has lost that distinctive military ring of finality that it once had. It has become an irony. It turned out that the sign was the US Navy's idea, to celebrate the return of the Abraham Lincoln from the war on Iraq, after an operational tour of 290 days. 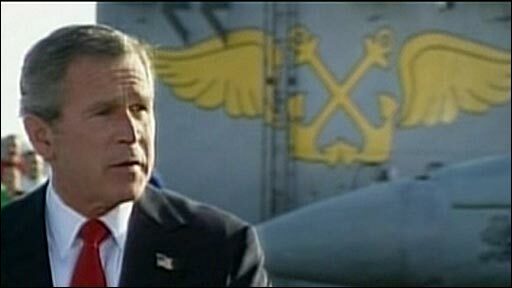 Mr Bush explained this in October 2003 and was supported by Navy spokesman Commander Conrad Chun, who told CNN: "The banner was a Navy idea, the ship's idea. The banner signified the successful completion of the ship's deployment." However, it was not quite that simple. According to news reports, the banner was made by a private contractor, with the help of White House staff. And there can be little doubt that those White House staff ensured that the banner was correctly placed for the cameras. Update: I have had an e-mail from a navy veteran who says he was on the flight deck that day: "After 10 months at sea, the ship's mission was accomplished, and we were going home. That was our banner. The President was there to visit us, our banner happened to be in the cameras view. I am sure that it made a great back drop, but the whole scandal of this banner that was belonging to my shipmates is ridiculous to those of us who were there. It was our banner and our day." Further update: the veteran has now sent me an e-mail from one of the wives involved. She says: "We had a huge homecoming committee... We had meetings with the Mayor of Everett and other high profile people. We mentioned to them we wanted to do it, the City and many other key people helped make it happen. As you can imagine a banner to be read from land on an aircraft carrier is huge!!!!! "At one of the many meetings someone said "Mission Accomplished" and that is what it said. The Lincoln had accomplished its mission, in a huge way! We had it made and sent it to the ship." So much about that visit was planned for effect - the location, the president dressed in combat gear, landing in the co-pilot's seat of a Navy S-3 when he could have used a helicopter, the television cameras. The banner destroyed the care that the administration had taken over the speech. The Defence Secretary at the time, Donald Rumsfeld, told journalist Bob Woodward in an interview in 2006 that he had edited the speech's draft, which had included the contentious phrase. "I took 'mission accomplished' out," he said. "I was in Baghdad, and I was given a draft of that thing to look at. And I just died, and I said 'my God, it's too conclusive'. And I fixed it and sent it back... and they fixed the speech, but not the sign." Mr Bush did in fact use the phrase himself a month later, telling American troops in Qatar: "America sent you on a mission to remove a grave threat and to liberate an oppressed people, and that mission has been accomplished." And Mr Rumsfeld himself said, on the same day as the Abraham Lincoln event, that major combat in Afghanistan had also ended. He declared in Kabul: "We're at a point where we clearly have moved from major combat activity to a period of stability and stabilisation and reconstruction activities. The bulk of this country today is permissive, it's secure." The story of the banner would have made a good episode of the US television series The West Wing. One can imagine the excited planning and then the gradual realisation over the following months that it was not yet mission accomplished. The face of the White House director of communications, Toby, would have turned even sourer than usual. Chief of staff Leo would have grunted. The White House, five years on, acknowledges that it was not well thought out. Press secretary Dana Perino said: "President Bush is well aware that the banner should have been much more specific and said 'mission accomplished' for these sailors who are on this ship on their mission. And we have certainly paid a price for not being more specific on that banner." What is interesting about that is how much optimism (and determination) it displayed, not just about Iraq, but about other areas of combat that are still at issue. "In the battle of Afghanistan, we destroyed the Taleban... "
"From Pakistan to the Philippines to the Horn of Africa, we are hunting down al-Qaeda killers." "The war on terror is not over; yet it is not endless. We do not know the day of final victory, but we have seen the turning of the tide."